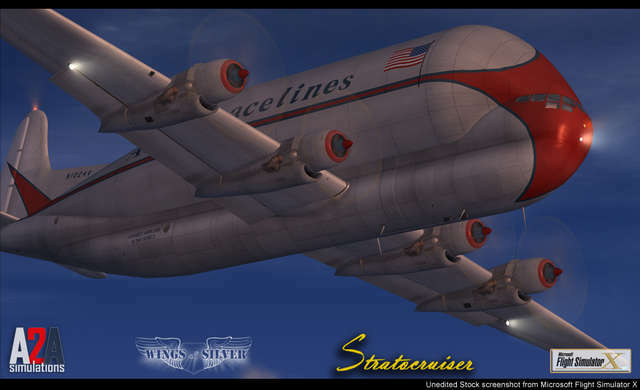 The Boeing Stratocruiser is a double-deck, pressurised, four-engine, medium to long range, high altitude, high speed, commercial transport plane. The aircraft has a service ceiling of 34,000 feet and a maximum range of approximately 4,000 miles. 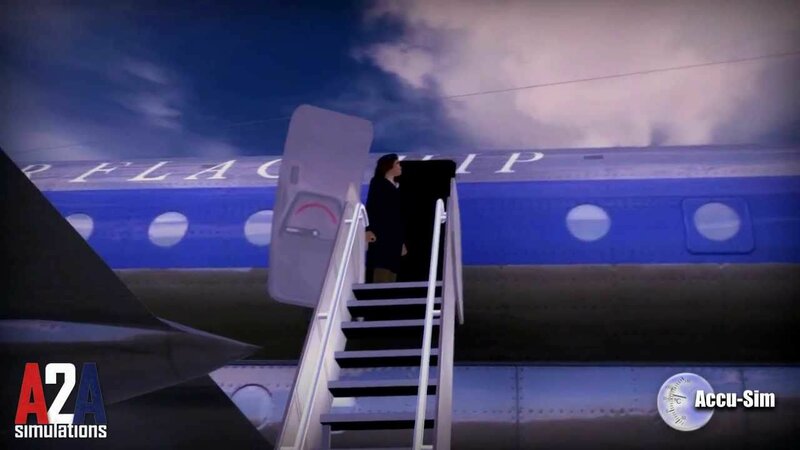 It is designed for a normal gross weight of 147,000 pounds, a high speed of approximately 350 mph and flew almost 100 passengers in first class comfort higher, faster, and farther than anything before. 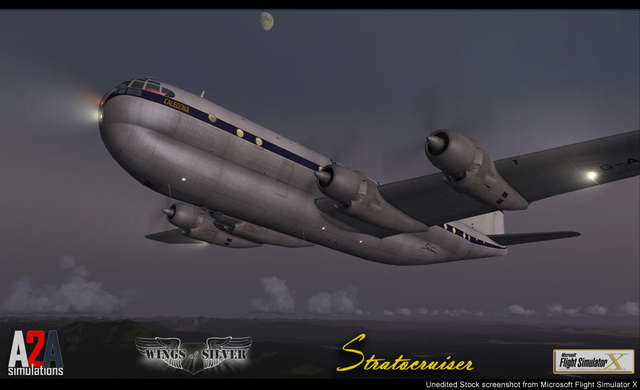 The Stratocruiser, with its massive Pratt & Whitney R4360 engines, represents the highest step in the evolution of piston-engined aircraft technology. 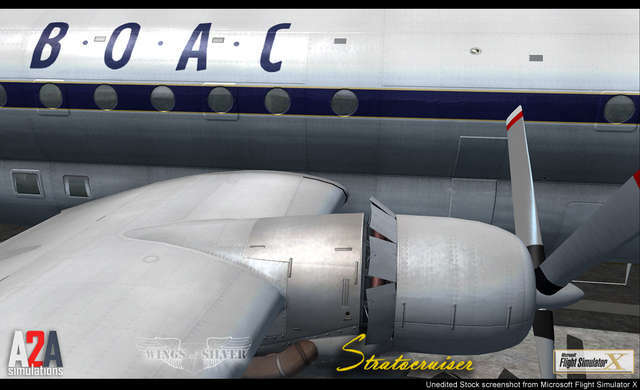 These engines were so powerful, that this huge Stratocruiser set the transcontinental speed record from Seattle to D.C.,beating both the Lockheed Constellation and the North American P51 Mustang. Even by today's standards this aircraft has amazing performance. Also included is a Pregnant Guppy variant that was custom-built to transport rocket components for the Saturn V to NASA. You have to see it fly to believe it. 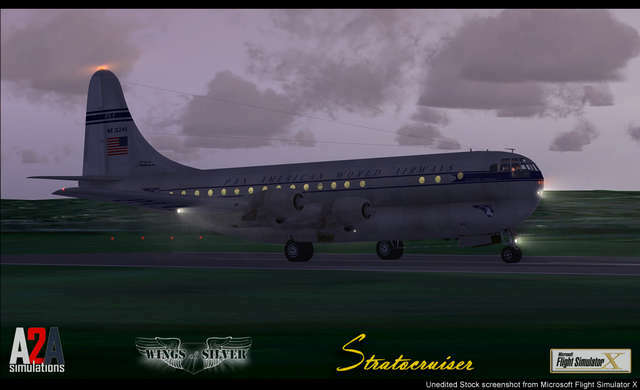 A2A Simulations has crafted and pioneered many new technologies for this aircraft which has become the flagship of their Wings of Silver line for FSX and the most accurate representation of a true 'classic' airliner. 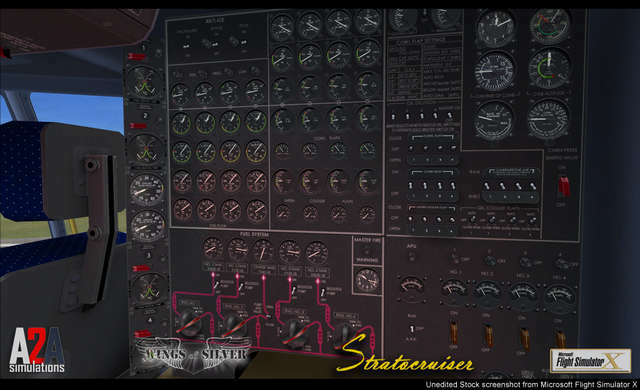 Four fully modelled and functioning crew positions – pilot, co-pilot, flight engineer and navigator. 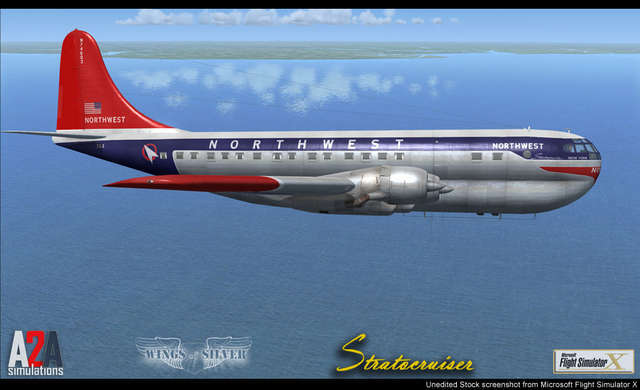 Five liveries: Northwest Airlines, BOAC, United Overseas Airlines, Pan Am and Aero Spacelines (Pregnant Guppy). Gorgeously constructed, inside and out, down to the last rivet. Built to be flown 'By The Book'. 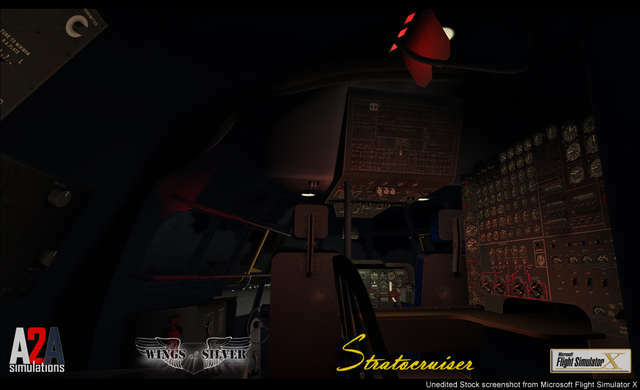 - Passenger and cockpit lighting for stunning visuals at dawn, dusk, and night. Historically accurate Eclipse-Pioneer PB-10 (autopilot) which looks and functions like the original. Twist the hand lever to bank, scroll wheel to adjust pitch, and toggle 'Altitude Hold' switch. Auto-Mixture that actually performs as intended. Now you can set for 'auto-rich' or 'auto-lean' and the aircraft fuel-to-air ratio will be automatically determined and set by the carburettor based on various factors such as altitude. Cabin pressurisation system controls. You control the target altitude and the rate of pressure change and the system authentically displays and manages cabin pressure. Hydraulically powered steerable taxi wheel, brakes, emergency brakes, rudder boost and windshield wipers. Pregnant Guppy aircraft included with authentic cockpit, systems and performance. Pop-up 2D clipboard to help calculate centre of gravity, ground speed and other important factors for flying. Custom Navigator's map accessible via keystroke or the Navigator's station. 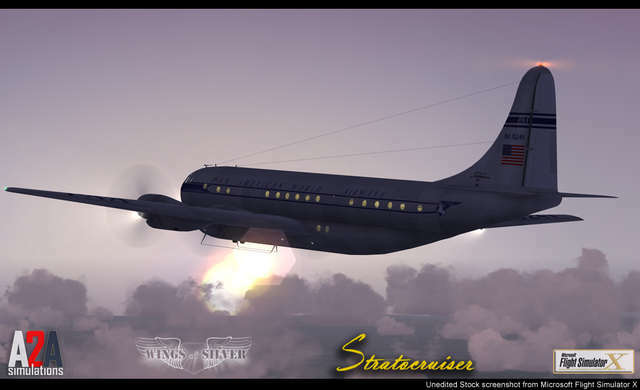 Please note; Due to the in depth simulation of the Boeing 377, shared cockpit multiplayer is not supported. 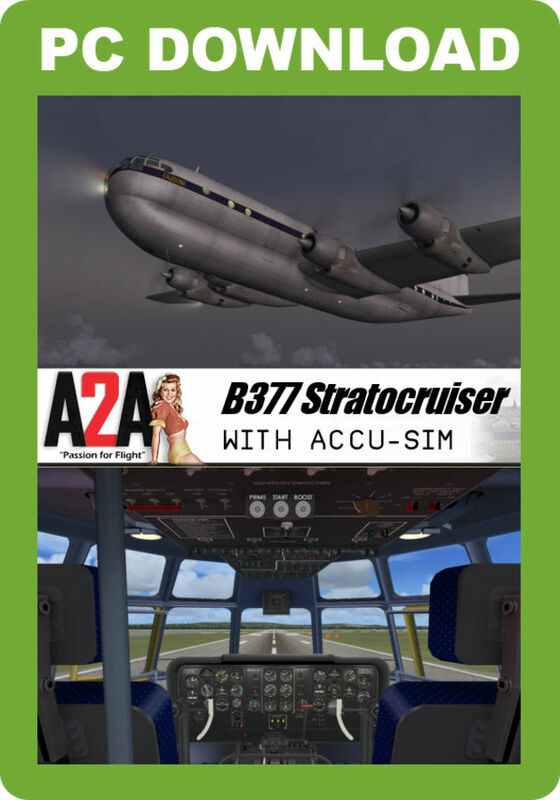 This package is complete with the A2A Accu-Sim Expansion Pack, providing an extremely high level of complexity and authenticity in the aircraft operations - see the Extended Description section below for full details. Use intercooler flaps to cool Carburettor Air Temperatures (CAT) as high temperatures can adversely affect engine performance, and low temperatures can lead to gradual carburettor icing. Spark plugs can clog and eventually foul if engines are allowed to idle too low for too long. Throttling up an engine with oil-soaked spark plugs can help clear them out and smoke will pour out of exhaust as oil is burned off. On hot summer days you will need to pay very close attention to your systems, possibly expediting your take-off to avoid overheating due to radiant ground heat. 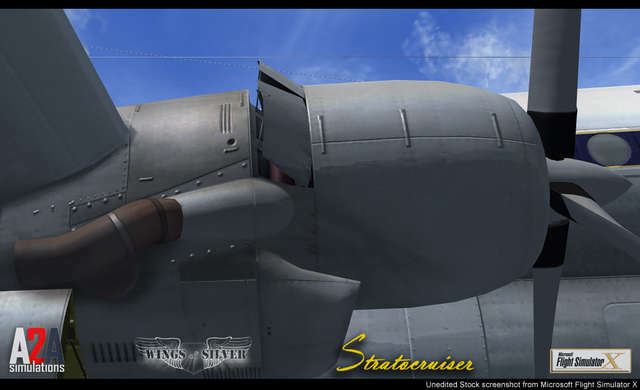 Experience realistic start-ups with an engine that can cough and sputter until it catches and turns over. Naturally speaking crew (American and British crews included). Your crew can help you, the captain, fly the plane by giving you critical information when you need it. 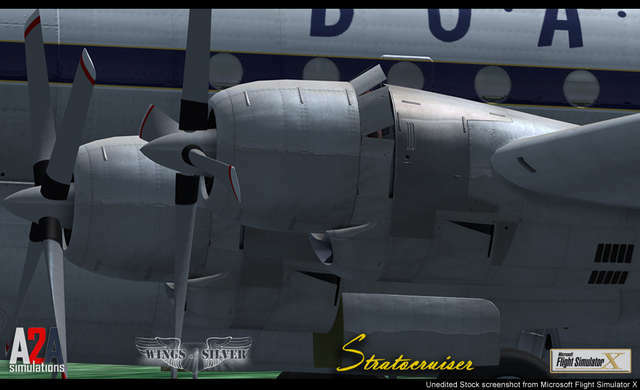 For example, the Stratocruiser has a built-in take-off flap warning system that sounds if you apply more than 3/4 throttle and the flaps are not set to take-off position. If you apply throttle with flaps not properly set and hear this warning, your copilot will make a comment like, "Captain, you need to set your flaps to 25 degrees for take-off." Your flight engineer gives you advanced updates on systems, giving you time to react. Crew speech is not robotic but quick and natural. 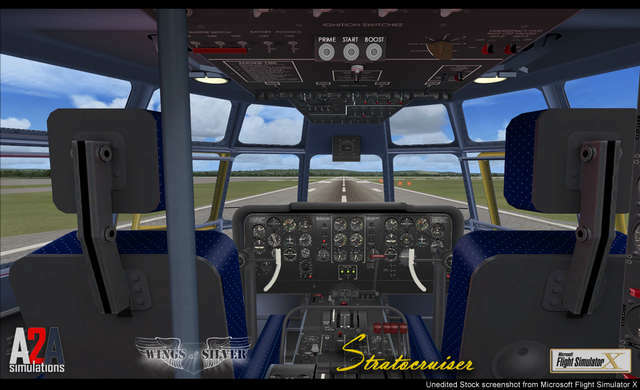 This system was created to help you fly the plane, just like a real crew, and to make your experience more pleasurable. Environmental sounds including everything from passengers to brakes squealing to the aircraft creaking. New career system is based on how well you manage your aircraft systems, quality of flight, and emergencies. This Is Your Captain Speaking... The captain keeps passengers informed on the flight’s progress. A Live Engineer manages systems which allows a true left-seat experience. 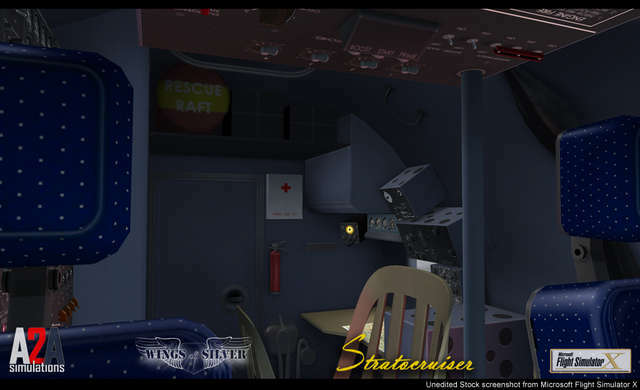 Virtual flight attendant performs her duties and reports to the crew. Navigator’s station with real-time monitoring and calculation of wind and flight conditions. Natural Speech constructs sentences dynamically from a pool of over 1,000 sound recordings. 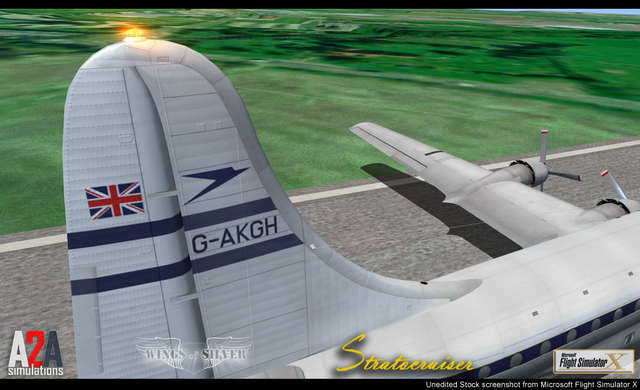 Accu-Sim physics system shakes the cockpit and airframe based on both external and internal conditions. Deeper systems modelling throughout including oil pressure loss, friction heat and cabin pressurisation failures. New Cabin Pressurisation Module driven by the turbochargers. New Climate Control Systems including 24,000 watt air conditioning compressors along with dual body heaters. 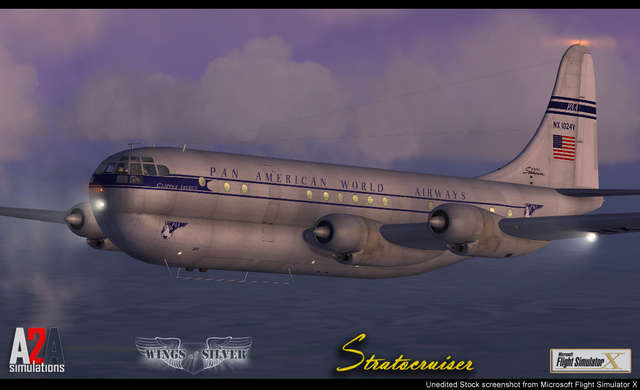 This A2A package includes the long-range B377 Stratocruiser built after WWII, with four fully modelled and functioning crew positions: pilot, co-pilot, flight engineer and navigator. 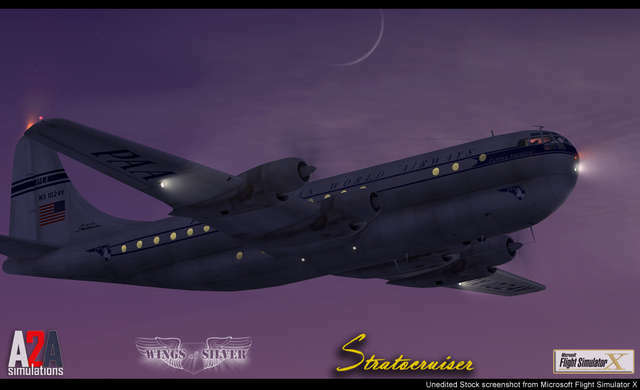 This is an aircraft designed to be flown 'by the book' in FSX! 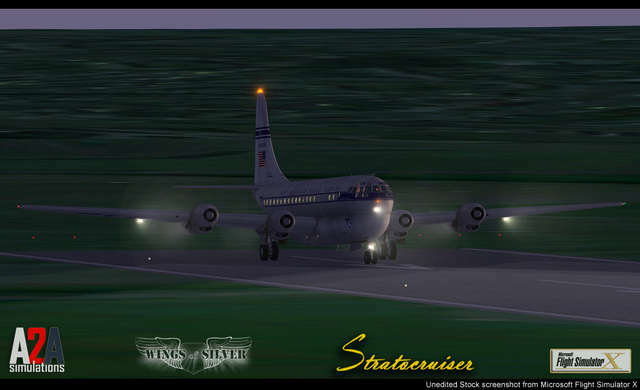 Countless accurate features are modelled and the aircraft is complete with A2A's Accu-Sim enhancement package which provides an even greater level of authentic complexity and accuracy in the aircraft systems and functionality.